The cooking scientists cannot agree over the subject "curry". Where does it come from, what are the main ingredients, and so on. Most think it originates in India, but is now part of the menu in many countries like Malaysia, Indonesia, Thailand and Bangladesh. The Thai insist, however, that their curry is totally different from the other curries. The curry has been imported into Europe by the British colonialist and consequently shipped onwards to the United States. Nowadays, curry is popular all over the world. The preparation has changed also over time. 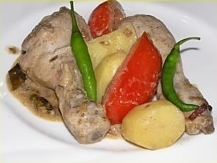 When I was a young girl, if someone prepared curry (which was quite exotic back then) it would be a stew of chicken breast cubes, curry powder and raisins. Nowadays, it is moving towards a stir fry with vegetables, fish and or/meat and fresh spices. 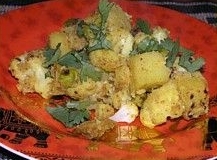 Sometimes, coconut milk is used, and also fresh herbs like coriander. Even the turmeric (the ingred ient, which makes curry powder yellow) you can find fresh from time to time. Actually, Thai recognize the curry as part of their menu, but Indians and Bangladeshi deny, that it is something they would ever eat. According to them, it is an invention of the British, who just put meat, a spice mixture and something wet, and then say it is curry. My own impression is, that they do eat something that looks like my curries, but give it a different name sometimes. But indeed, the first versions of curry did not look remotely like what is eaten in India or Bangladesh. 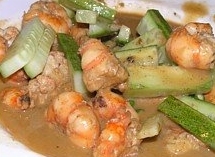 The word curry is said to come from "Kari", which means "secondary dish" (next to rice) in Tamil. The curry may contain curry powder, but also other spice mixtures are possible, like korma or garam masala. 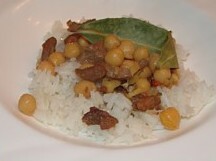 The recipes on this page may not be named "curry" by all cooks, as the definition appears to be hazy. But whatever their name may be, they taste delicious. The recipes come from nine different countries, namely India, Malaysia, Indonesia, Thailand, Myanmar, Singapore, Nepal, Vietnam and Bangladesh.